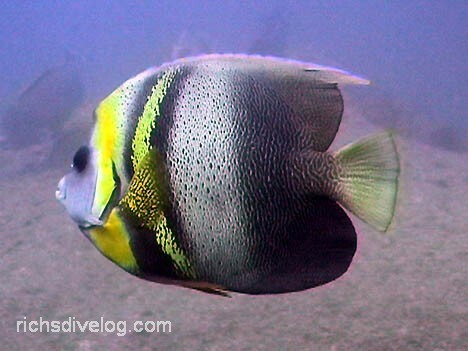 Cortez and king angelfish are abundant off the East Capes. Dive Journal: The four of us have flown south from Phoenix to the Cabo San Lucas airport. Unlike most of the tourists, however, we’re renting a car and heading east from here, up the eastern facing coastline to the small town of Los Barriles. Linda’s gotten us a killer great rental house right on the beach in Los Barriles. It is a comparitive mansion, with large beachside porch, coconut palms, stately pillars, and its own sea wall. The open floor plan is hugely spacious and the place could easily sleep twelve. Linda has come through again – she could be a great luxury travel agent. When we first enter the water, we are immediately surprised and pleased to have 40+ foot visibility and cool but comfortable water, in the seventies at least. There is very abundant sea life here, and we’re loving the numerous yellowtail surgeons, grunts, gofftopsail pompano, and eels. There are quite a few crown-of-thorns starfish here, and we also see 4 or 5 big tarpon-like fish. The terrain consists of lots of large rocks with little or no sign of coral. We pass through a shimmering thermocline and into the low 70s. It is the coldest I’ve ever seen Johnny on a dive – he is visibly in the deep shakes. I signal for him to rise up a bit if he wants, but he declines, deciding to tough it out. Linda comes across a stunning black and white eel, later identified as a zebra moray. I also come across a big green moray and a handsome giant hawkfish. Happy birthday to Johnny, his 15th! !